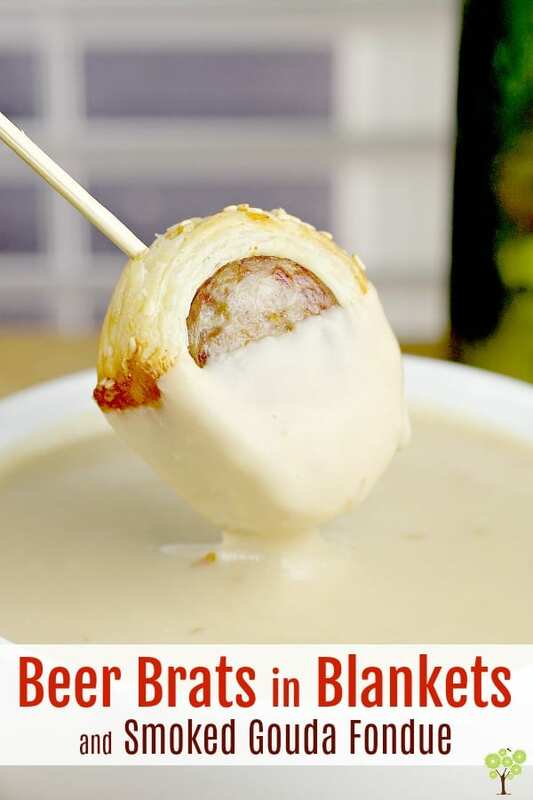 Savory bratwurst, simmered in dark German lager, wrapped in puff pastry, and served with a rich and smooth Smoked Gouda Fondue. 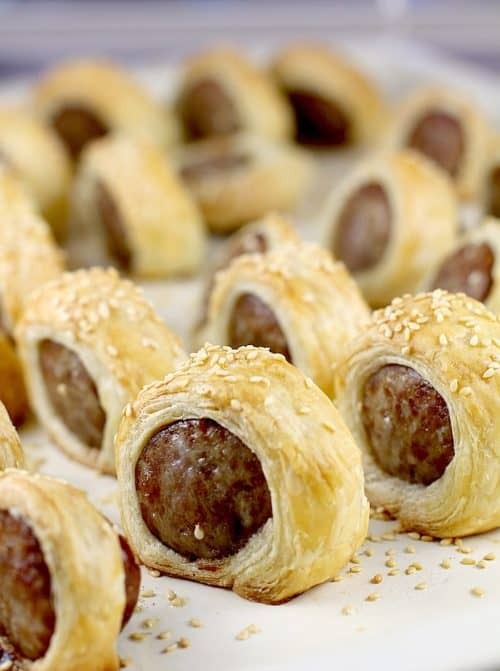 This phenomenal combination of flavors and completely new take on “Pigs in Blankets” will make any party, any occasion, absolutely perfect. 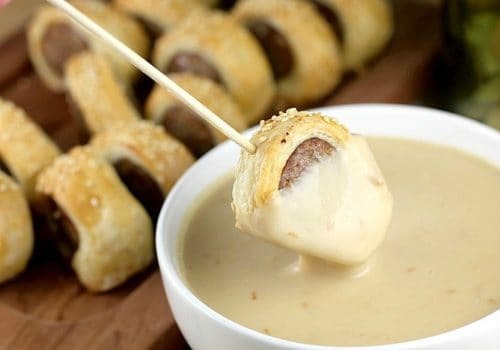 This Beer Brats in Blankets and Smoked Gouda Fondue recipe is sponsored. 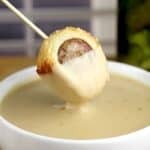 Oh my dear Lord, this Beer Brats in Blankets and Smoked Gouda Fondue recipe. This stuff is so so good, I cannot even handle it. This FONDUE alone is so fantastical, I’ll be making it time and time again. I had no idea fondue was so easy! And of course to spin it into a beer cheese ….I am so patting myself on the back. This is that good. For this Beer Brats in Blankets post, I am working with Warsteiner beer and am I so happy about that. Warsteiner is a favorite for my husband. When I got it at home for this post, he was all happy happy. Like, overly so. His German heritage glowed brightly. And I didn’t know this until now, but apparently this has been a thing for him ever since we started going to the Food and Wine festival at Disney every year …he always stops in Germany for the Warsteiner Dunkel. Who knew. Warsteiner has been brewing their beer since 1753. It is available in 70 countries, so no matter where you travel, you will probably be able to find it. Little note of trivia: Warsteiner is brewed with water from the Arnsberg Forest …or the happy tears of nymphs or what-not. This soft water is ideal for brewing so they are devoted, and it is in accordance with the German Beer Purity Law of 1516 …I think it is fantastic that Germany has a 500 year old Beer Purity Law. America needs to get on that. So for this Beer Brats in Blankets recipe, I used the Dunkel because that is the Warsteiner that is the most “stout-ish”. And cooking with stout-ish beer, especially when making a cheese sauce, is the best. 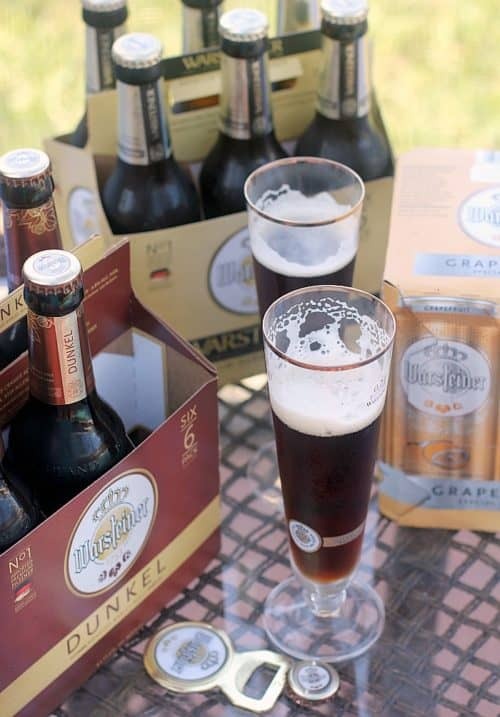 The Dunkel is dark and rich, amber and smooth with a roasty flavor. It pairs well with assertive things like sausage, grilled meats, and spicy stuff. This is precisely why I used assertive smoked Gouda in the fondue, because it paired with the sausage and Dunkel beer perfectly. 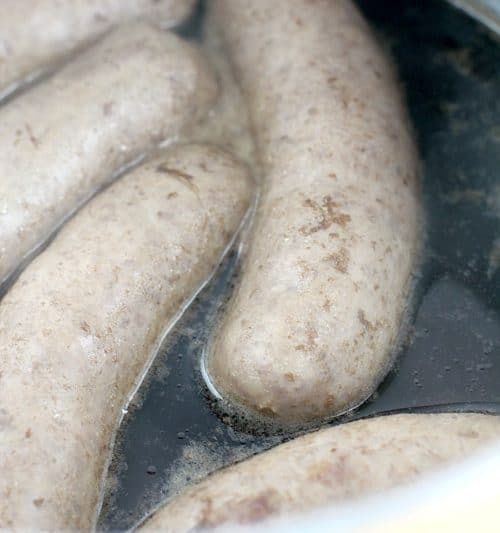 Alright, so what did we do for this recipe …first, we simmer our brats in a couple Dunkel beers. Let them cool a bit, then we wrap them up in puff pastry and slice. Little egg wash, some sesame seeds to spruce them up, and they are ready for the oven. Then while they are cooking, we make a very simple, very easy, very basic, very fantastically delicious fondue cheese sauce using smoked Gouda, sharp white cheddar, a little Dijon, and, of course, MORE BEER. That’s it – really easy and SO DARN GOOD. So that’s it folks! Beer Brats in Blankets and Smoked Gouda Fondue. 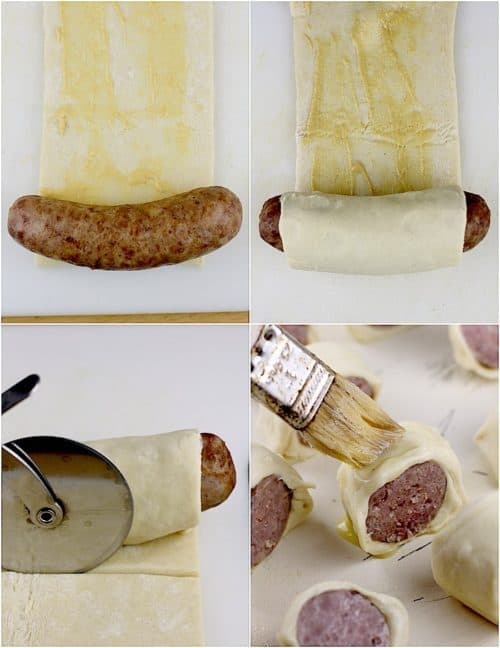 Pigs in blankets …elevated. Juicy sausage, flaky puffed pastry, and this ridiculously delicious fondue. Cooking with beer is one of the great joys in life, especially in a recipe like this where all these flavors really shine. 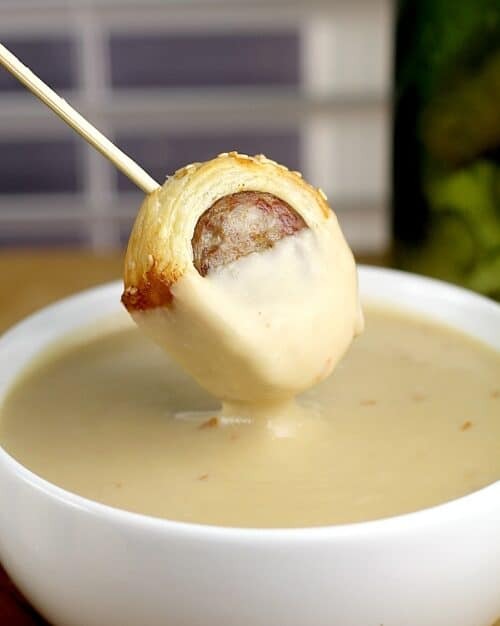 Savory bratwurst, simmered in dark German lager, wrapped in puff pastry, and served with a rich and smooth Smoked Gouda Fondue. Lay out the puff pastry dough. Shmere with a ~tablespoon of Dijon mustard. 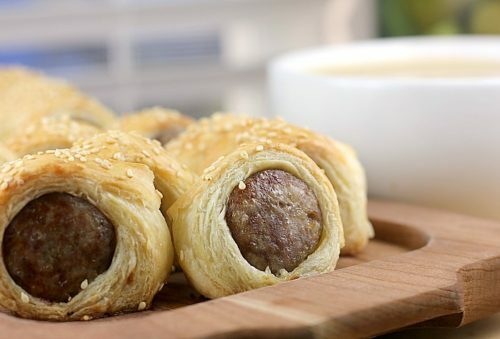 Wrap the brats in puffed pastry, then slice to 1-1/2 inch slices. Stand each piece up on a bake sheet. Brush each with egg wash, then sprinkle sesame seeds over top. Bake at 400F for 25-30 minutes or until golden brown. 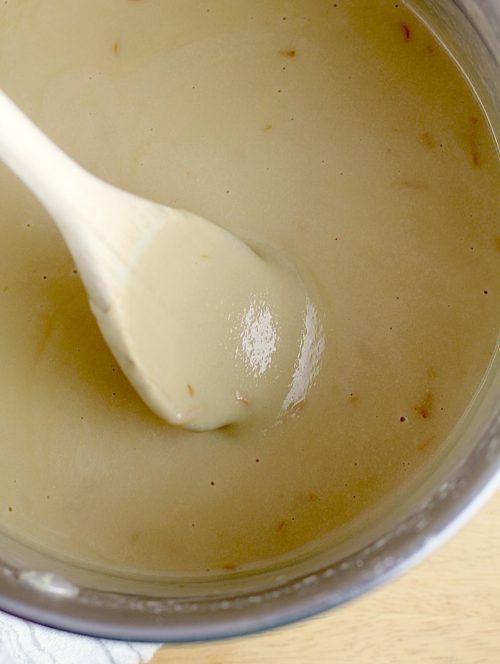 While brats are cooking, prepare the Smoked Gouda Fondue: in a medium saucepan or small crockpot, add the remaining 8 ounces of beer and remaining 2 teaspoons Dijon mustard. 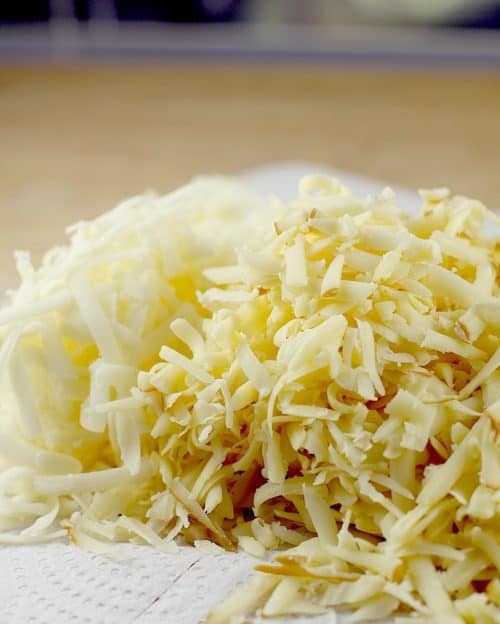 Add the cheeses and heat, stirring often, until cheeses are melted and mixture is smooth. Serve the Beer Brats in Blankets with the Smoked Gouda Fondue. Yields approximately 26 party bites. Leave me a comment! Otherwise, I’m just talking to myself here, and that’s no fun. How do you love to cook with beer? This reminds me of something we had on a trip that I loved. I would love to try this! What a fantastic flavour combo! We love brats here, but I’ve never wrapped them in puff pastry before and now I don’t know why! Loving your smoked gouda fondue too; I want to eat that by the spoon! OMG! I love gouda! This looks so yummy! You had me at the cheese and I stayed for the beer brats. What a fun and simple recipe! I don’t love beer but in food I’m all in. This looks like an amazing dinner or appetizer. So I try to eat healthy. But, these sound so tasty. I love gouda. Maybe for a treat. I’m actually in Germany right now and I’ve been trying all the beer and sausage here! 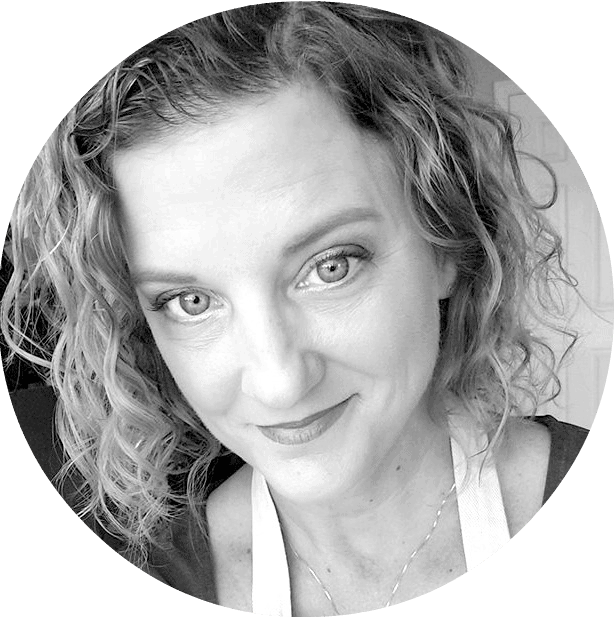 (I’m more of a wine and salami kind of gal typically, but being out here has made me want to try it ALL and I am so impressed!). This fondue looks drool-worthy! I’ve never done fondue at home, but I NEED to give this a try! What a delicious summer pairing! For the love of yum this sounds amazing! I can picture a fire going in the background and a relaxing night with my husband and a plate of these that I may or may not share lol! The beer gives it an extra flavor. It looks so yummy! Yum! This is genius and looks so delicious! Pinning for later! Oh my goodness! This looks so so good! I have never made brats before, and I’m not entirely sure why. Definitely want to try this. Holy cheese fondue!!!! This looks so tasty!!! Can’t wait to give it a try. What dough brand do you recommend? Hi, do you know what liquid I could substitute in the fondue for the beer for a kids version? We want to bring this to a picnic, but what is the ‘stay value’ on the cheese? Like – does it have to be served hot, or else it will harden back to cheese form? How long will it stay liquid-y good?? OMG, this was fabulous! Thanks! What could I use in place of the beer to make this gluten free? Would a cider work or am I better off using vegetable stock as noted for the non alcoholic version?